The students Deligianni Eleni- Olga, Mavrigiannaki Aggeliki, Nana Marianna, Theochari Dimitra, Vrouva Antigoni seeking for "A memorial to a memorable event" (the title of the Students Competition that they participated in) chose the Memorial of Thermopiles Battle. 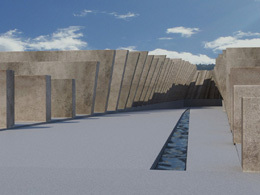 In the frame of memorial landscape issues, they decided to design this monument of national history and they tried to re-approach history and to redesign in the historic topography the battle's atmosphere in order for people to be attracted to experience it and, later, rediscover history. Their participation under the title: "A Crack in History" was distinguished among the 92 propositions submitted in the 10th place and it was the only Greek proposition that reached the last phase of the competition. But what the participants themselves comment? 480 BC. The Persian Empire, greater than ever, demands to dominate the Greek City-States. Greek tribes gathered to fight against this stronger opponent. Persians outnumber Greeks who use every strategic mean in order to preserve their Freedom and their unique right in Democracy. Under the command of Spartans, all Greek Free-Citizens stand in the area of Thermopiles and fight. They are no more than 6,000 men that feel responsible for transcending this need imposed by fate, for they defend their country against 5,283,220 Persians (according to Herodotus, but according to modern historians 110,000:400,000). Their battalion of archers were said to be that many that if their darts were blown simultaneously, they could hide the sun light. Having heard that, the Spartans responded: "That sounds great! We will fight in the shade!" This single fact is good enough to show the arrogance and determination of Spartans that were willing to die rather than obey a Foreigner Barbarian. They are determined to win for the sake of the law they believe in. Thus, they choose the narrowest passage that presents the Greek bas-relief to prevent the onslaught of the Persians; that is Thermopiles, which means Hotgates. This highly strategic area is almost in the center of Greece. Thermopiles describe a 15 km pass between the mountain Pindos and the Aegean Sea which at that time was so narrow that partly it couldn't fit a chariot. In addition, it was divided by 3 rivers and 3 straits. For, Thermopiles constitute the most adequate place in Greece to fight against a huge army. The Persians for 3 days straight had thousands of dead and couldn't cross through and conquer the rest of Greece; even the Immortals (their best battalion) were taken down. It was then that Xerxis, the Persian emperor, understood that there would be no victory if they wouldn't find a way around the mountains. They were lucky enough to find a traitor, whose name was Efialtis (which means Nightmare) and, since that, it is forever kept in Greek History to have such a bad meaning. When the Greeks found out that Persians were shown the way around Thermopiles they were ordered by Leonidas, the Spartan King, to retreat in order to survive and to be able to fight against the emperor in the future. Everybody was to leave apart from the 300 Spartan soldiers that their laws and mentality would never accept retreat. War would end either with their victory or with their death. But, the 700 soldiers from Fokea couldn't stand the idea of leaving them alone, so they demanded to stay and die with them. At the crack of dawn the Spartans attacked the enemy and fought with bravery that World had never seen before. They all died; the one after the other, all fighting. When the last of them were surrounded around the hill of Kolonos, which accommodated their camp, the Persians were still so afraid to go near them that killed them only by arrows from a distance. Archaeological survey found hundreds of metal arrow lances' that can prove the storytellers. In the competition's brief you apply that "certain events in history help to shape a society's identity". However, we wouldn't consider that this battle has shaped our Greek Identity; in contrast, the Greek Identity was already formed in such clarity and completeness that they were ready and worthy of the circumstances to take decisions that formed the global history. Nowadays, this part of Greek history that shows the Greatness of Greek Spirit is weakly mentioned in History Books. The analysis the historic basis and geographic particularities of the battlefield is not enough for one to understand the great impact of the battle; a battle of Democracy against Monarchy. The victory of Greeks over Persians at Thermopiles halted the policy of expansion and dominance of the Persians and thus contributed to the shaping of European culture which is far from the Asian one. Today, the monument placed in the battle field, is not equivalent to the historic importance of the area. There is nothing but a statue and some trees, which only few foreign tourists visit. As a consequence, we decided to redesign an adequate monument to the importance of this historic fact. Moreover, the site of the monument has greatly changed over the years, and we believe that by taking advantage the creation of the new National Highway, that helped with the congestion of the area, we can propose much more than a monument; we propose a great landscape project that would attract tourists and can achieve sustainability. Last but not least, there is a strange geological phenomenon that takes place in the historic site. Since many rivers flow into the region because of very intense relief, annual rainfalls have led to descend very large quantities of eroded land that continuously remove the coastline. This geological phenomenon takes place as if it wants to conceal the historical fact, when, as a result of this phenomenon, today there is no longer the perception of narrowness that gave the region its strategic importance. This criterion, or in other words, the need to rebuild a sense of narrowness through new spatial elements in the same landscape is our top priority. Our memorial acts both as a narrative experiential space for the battle and a visitor center. This experiential symbolic narrowing is placed directly on the trail of the lost coastline in order to bring out the memory of the landscape and redevelop history. We decide to use water as an element to narrate the story of the two armies and for this reason we place it exactly on its ancient trail, which prejudged the outcome of the battle. Consequently, water symbolizes the coast line and forms 'a liquid snake' which correlates and contradicts with a system of vertical plates that create the limits of our 'crack in history', a dynamic oblique line that goes along with the historic battle line. These vertical plates are exactly 300, as the Spartan Soldiers that put their duty to their country above their one lives, and they form 'sinewy wings' that highlight different qualities in framing space perspectives; their dimensions are strictly calculated to through designed algorithms. One of our basic principles was not to touch the bas-relief of the mountains and hill Kolonos in order to bring out the wilderness of the area to let people mentally assimilate the battle field. There today you can smell nature and feel the agony of being surrounded by thousands of Persians. Thus, one would say that an area of such a strategic importance and such a heroic battle is actually sacred. Consequently we choose to design from the outset our artificial level of intervention, which we will not exceed since we decide to create a window in time and in history. This level is actually a non-level since it is an artificial area that is provides the development with the development of a new perspective of historic facts. The first level is the 400 m of the designed Crack in History that offers all museum- relative activities and leisure spaces as well as the visitor center. The second level is walking along the trail of the ancient coastline for 4, 5 km, which is all the area where the 3day battles unfolded. The trail is indicated through vertical plates that periodically present Herodotus storytelling of the battle. The third level is for nature-lovers who have the ability to walk at the trails of Persians who guided by Efialtis walked around the mountains and surrounded the Greeks. This last path is about 17 km begins from the Persian camp and ends in Kolonos hill, the Greek Camp and the final space of sacrifice. At the same time, on our Crack in History we have created a two way path that is also crossed over by the symbolic path of Efialtis, and we let the visitors decide from which side they want to experience space. Both sides are designed with such pre-calculated framings of perspective that give completely different spatial experiences. This contradiction in created in order to accentuate the supremacy of the Persian army versus the primacy of strategy of the Greek side. The Spartans are steadily guided to narrower spaces before they reach their dead end which symbolizes their constant awareness of their duty to the law, while the Persians confront a reverse perspective which symbolizes the momentum that goes with knowing that they have them surrounded. As a result, through our memorial we pose the question to the visitor: Which side are you on? Both sides are accompanied with the trail of water which meets exactly in the middle by making a lot of notice where the last scene of the sacrifice took place. At this place the interactive museum is placed and there is an exit directly to Kolonos hill, in order for visitors to pay tribute to the dead. However, when designing we dealt with several matters such as: The question whether this provision gives correct shading and plasticity in the construction and comparison of the morphology of strong relief, The contrast of the construction with its background, The material we choose to use, their structure and colors, the reflections, The proposal of tree-series in areas where they do not hide the memorial from the new National Highway, The technical lighting of the Crack of History in order to bring out the narration to passersby even at night. Last but not least we suggest possible monuments that may narrate specific battle scenes such as: A metallic complex installation of 'the arrows that hid the sun' and A hemispherical construction with spears that symbolizes the Kolonos Hill after the Persian Victory. All these criteria acquire our propositions with certain sustainability and life duration since it provides to visitors so many and various interests and opportunities of navigation that as many times they visit the memorial, so many different experiences they may cherish. On the other hand, all our interventions do not reform the landscape dramatically, but offer opportunities to add or remove elements at any time. The expected visitors do not acquire a specific target group, but the memorial is addressed to all history seekers in the planet, Greek or Foreigners. Taking under consideration that even today there are people that visit it, imagine what would happen if a memorial of such a scale would take place its place. To conclude, our principal intention is a nod to the seeker through creating a crack in history that will serve as an open window in time. Our gesture to form an experiential space on the ancient battle trails is what intensely correlates our solution with the need in historic memorials of our contemporary society. Above all, our memorial serves the recollection and our social collective memory of the historic fact of the Thermopiles Battle. 10th place (02 star) at 8th CAA International Students Competition (Commonwealth Association of Architects) "A memorial to a memorable event"
The students would like to thank their professor Dimitris Sevastakis for his support and advice.